I love Las Vegas. Sure, I enjoy the lush hotels, the waterfall pools, the Cirque du Soleil acrobatics, and the all-you-can-eat buffets, but that is not what I mean. I mean I love the casino industry. It is the only industry I know of that has a business model based on the mathematical certainty of profits (life insurance is a close second). Casinos know that they will make a profit from their gaming operations (they don’t like to use the word gambling) because the odds are always in their favor. Take American roulette, for example. A bettor has 38 numbers to choose from: 0, 00, and 1 through 36. The odds of the ivory ball falling on the number chosen are 37 to 1, or, put another way, a 1-in-38 chance. Based on the odds, a gambler who bets $1 on a number should receive $38 back if her number comes up on the wheel. Does a bettor at a casino actually receive $38 for a winning number? No. He gets only $36. This $2 deficit is what is known as the “house edge” and amounts to 5.26% of every dollar bet. In other words, over the long term, a casino knows, with mathematical certainty, that it will collect a profit of $0.0526 per dollar wagered. What does this casino talk have to do with selling stock options? Just as the payout in roulette is based on the probability of the ball falling on a particular number on the wheel, so too is the price of a stock option based on the probability of the stock landing on a particular price on the date of the option’s expiration. Let’s say you are bullish to neutral on the S&P 500 ETF (SPY) and want to generate some income from this view. You could, for example, sell a March put on the SPY. It’s best to choose a heavily traded ETF or stock with a liquid options market and SPY is just about as liquid as they come. As of this writing, with SPY currently trading around $267.35, one possibility would be to sell a SPY March $255 put for 2.45 per share, which is $245 per option contract since each option contract represents 100 shares of stock. When the option expires on March 16th, the price at which a seller of this put would break even is $252.55 ($255 strike price minus $2.45 credit received), meaning that you would make at least a penny of profit on the option if SPY closed above $252.55 and you would lose at least a penny if the SPY closed below $252.55 on the March 16th expiration date. A 2012 study of index option prices found that selling options can be very profitable because index options (such as the S&P 500) have historically been overpriced. Which, of course, favors selling (i.e., writing) options. Because the actual math to prove an option’s fair value is mind-numbingly complex, we need to use a computer and options software to determine the probability that SPY closes above $252.55 on the March options expiration date. And keep in mind that even the best options valuation models are based on estimates of future stock volatility (unlike dice in a craps game, which have definite probabilities) and these estimates could turn out to be wrong. Based on the options software that I use, the probability that SPY will close above $248.15 on March 16th expiration is about 77%. Those are pretty good odds for making money. 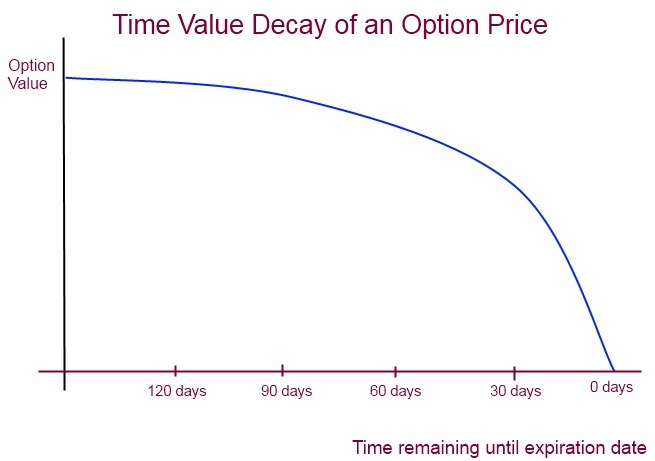 Options have a unique feature called time-value decay. Since options are, in essence, a bet on the future price movement of a stock, time is a prime component of an option’s value. The less time remaining until expiration, the less value an “out-of-the-money” call option — an option whose strike price is above the current stock price — has, because it becomes less likely that the stock will rise enough to let the option expire “in the money.” With each passing day, the time value of an option inexorably declines. What does time decay mean for our short SPY put? Assuming the price stays the same, time decay ensures that the put’s value declines, which means that your profit would increase because you could now “buy to close” the short put for less than what you initially sold it for. Time works in the position’s favor. As each day passes, the probability that SPY remains priced at more than $248.15 at its March expiration increases, thereby pushing your put position’s expected profit more and more above the zero line. Options analysis software can help you calculate that this probability of profit increases from about 77% today (December 14th) to 82% on January 14th to 90% on February 14th. This means that the fair-value price of the SPY March $255 put would fall to around $1.45 on January 14th and $0.50 on February 14th. Assuming everything else remains constant, the expected profit of your short put position in one month’s time has moved from zero to 1.00 per share, or $100 ($245-$145) per contract. Just as time decay works for the options seller, it works against the options buyer. Thus, after one month, with nothing else changing, an option buyer is -$1.00 per share in the hole and still sinking. That makes options buyers a lot like casino gamblers — sure to lose over the long run. In fact, selling time decay is a high-probability trade precisely because an options seller has three chances to win and only one chance to lose. In our SPY example, the seller of the March $255 put wins if SPY’s price stays the same, rises, or drops a little. He or she loses only if the price goes down significantly. In contrast, the buyer of the March $255 put wins only if the price falls significantly. Can you imagine any other stock-based investment that lets you guess wrong about the stock’s future direction by upwards of 5% and still generate maximum profit? I can’t. Does this mean you’ll profit every time? Of course not, even if the odds are in your favor. A 77% chance of profit on the SPY March $255 put still means you’ll lose 23% of the time. Also keep in mind that just because the S&P 500 may initially make a big down-move in the wrong direction doesn’t mean it will stay “down there.” It could easily make a round trip by its March expiration and return to a profitable price point. Casinos understand that the house edge applies only over tens of thousands of roulette-wheel spins. That’s why casinos, despite their house edge, limit how much a gambler can bet on any one spin. They don’t want to be bankrupted by a gambler’s single, gigantic lucky bet. Options traders need to adopt casinos’ mindset. You should limit the amount of capital risked on any single option position, then sell options (i.e., time value) in an endless series of small trades to capitalize on the small long-term edge options sellers get from time decay. Small is beautiful. Taking advantage of time decay is not a get-rich-quick scheme, but it does seem to work. Why should Las Vegas casinos have all the fun?